In 2015 Google launched the Chromecast Audio. We are now in 2018, is the Google Chromecast Audio any good? This is my full review. Music is a very important part of my life. I could live without TV, but not without music. One of the most positive things about the internet (in my opinion) is the music revolution. Suddenly the world of music was accessible to everyone. I was able to buy and listen to tracks from everywhere in the world thanks to the Internet. The choice is limitless and would never fit in the biggest music store like HMV. A lot of bloggers are used to sharing their Spotify playlists. Personally I am not a fan of Spotify as I much prefer Google Play Music. 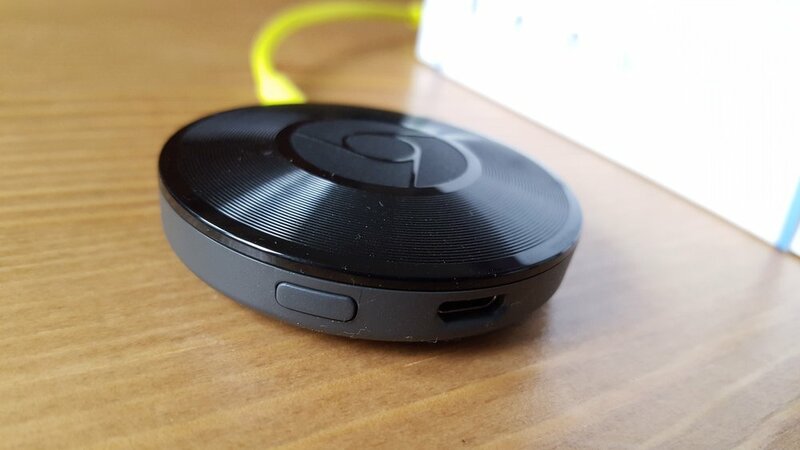 I recently purchased a Chromecast Audio from PC World and here is my full review of this amazing little gadget. what is chromecast audio by google? Until now I have been streaming my music from my smartphone to a bluetooth speaker. Even if the sound is good it's not the best solution to enjoy a great music session. The problem with bluetooth speakers is that you get all the annoying notification sounds, incoming calls etc... So if you are very active on social media, you might get a lot of notifications while listening to your favourite tunes. That's why Chromecast Audio is the best way to stream music. It connects through your home WIFI and "casts" your music selection without interruption from notifications, phone calls etc... This is actually very good because you can be multitasking with your phone/tablet or laptop and still listening to your favourite tunes. Chromecast Audio has to be plugged to your existing music system or speaker with line out connection. I have a great LG hifi system at home, and I can enjoy a great, powerful sound thanks to my Chromecast Audio and suddenly my smartphone becomes my best remote control! Once you set up your Chromecast (it takes less than 1 minute), you will need to download the Chromecast app from Google Play Store or the Apple App Store. There are some great offers to redeem, like three months free Google Play Music (my favourite music subscription service), Dezeer etc... The Chromecast App will show you which apps are compatible to stream your music from (Spotify, Google Play Music, Deezer, Tunein etc etc). Once you know which music app you want to use, you just have to click on the CAST icon and it will magically stream to your speaker. As it streams through WIFI the sound quality is excellent too. The box is minimalist like any Google product and that's a good point. 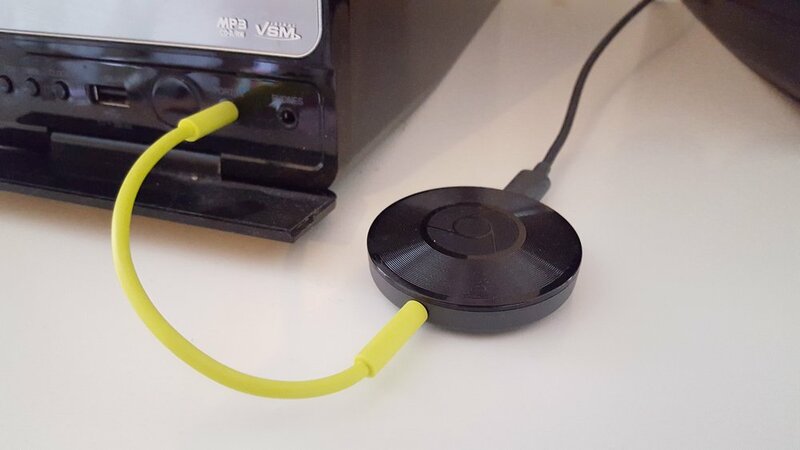 Inside the box you will find the round Chromecast Audio and the line out/jack cable in a funky yellow colour. Inside the box is a quick guide on how to use your Chromecast Audio. Google Play Music. This is a subscription music like Spotify. With the Chromecast audio you get three months free trial. It's very similar to Spotify but there are some differences. You can upload your huge music library to Google Play Music and enjoy your tunes with the millions of others from the subscription service. The design is very clean and less messy than Spotify or Apple Music, it is simpler and minimalist. The playlists are really impressive and some of the Indie music playlists are just fantastic. And one more important point in my opinion: each time you purchase an album or track or Google Play (they have much better deals than iTunes), it appears immediately on your library within the app. Tunein. I love this world radio service. You can find virtually all the radio stations from everywhere in the world. The quality with the Chromecast Audio is really good. I use it a lot to stream one of my favourite French radios: RFM. Spotify: As I said before, I am not a huge fan of it, but my wife loves it. Spotify works very well with the Chromecast Audio. Just click on the icon and start enjoying your Spotify playlists on high quality through your favourite speakers. Deezer: Another very popular subscription service with more than 40 millions tracks. Deezer has impressive playlists and the Deezer Sessions are a great +. Podcast Republic. If you are a big fan of Podcasts, this app is a must have for any Android Smartphone owner. The list of podcasts is impressive and it is compatible with your Chromecast audio too! I highly recommend the Chromecast Audio.This is an amazing little gadget that you must have if you are a music lover like I am. It is easy to setup, and the way it works is really easy (as tech should be!). The Chromecast Audio is not available on Amazon because the huge online retailer has decided not to sell any other streaming gadgets other than their own Fire TV (so no Apple TV or Chromecast on Amazon). In the UK you can buy it at PC World/Curry's, and the Google Store. It costs £30 and it is the best gadget I've owned in years! In 2018 the Google Chromecast Audio is still an amazing little gadget!